In partnership with The Royal Australasian College of Medical Administrators (RACMA), the QRGP is embarking on systematically embedding leadership capacity in the Queensland rural generalist workforce via the Queensland Rural Generalist Leader Program. More information is available here . The aim of the Queensland Rural Generalist Leader Program is to develop competence in medical management and a network of mentors to provide advice and, if necessary, coaching for those in and considering taking up leadership positions in remote and rural Queensland. The Program will initially focus on providing leadership development opportunities for those who are Fellowed; in due course work will commence on embedding leadership concepts and opportunities within the Pathway itself. 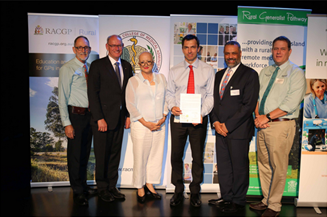 The Queensland Rural Generalist Leader Program was launched in Toowoomba on 7 December 2016. At the launch a Commitment to Collaborate statement was signed by representatives from the Darling Downs Hospital and Health Service (DDHHS), Royal Australasian College of Medical Administrators (RACMA), Australian College of Rural and Remote Medicine (ACRRM) and Royal Australian College of General Practitioners (RACGP) Rural. Dr Denis Lennox, Executive Director Rural and Remote Medical Support, DDHHS; Prof Michael Cleary, President, RACMA; Assoc Prof Ruth Stewart, President, ACRRM; Dr Peter Gillies, Chief Executive, DDHHS; Dr Ayman Shenouda, Chair, RACGP Rural; Dr John Douyere, Medical Director, Queensland Rural Generalist Pathway, DDHHS.